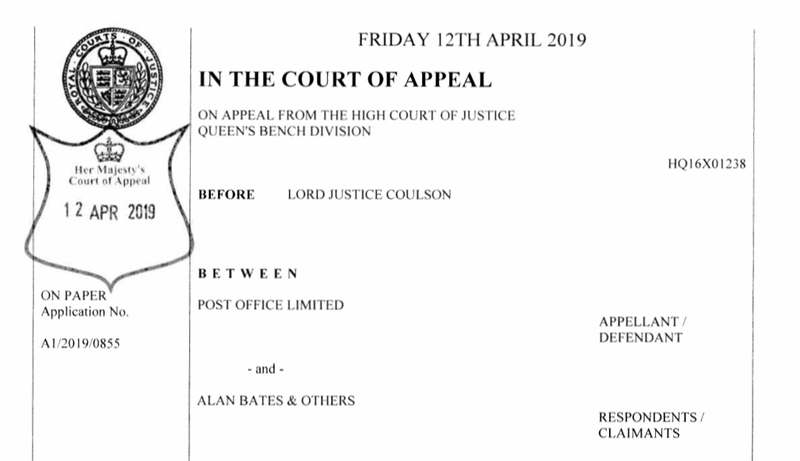 This is the first of what will likely be many documents produced by the Court of Appeal pertaining to the Bates v Post Office group litigation. It is a remarkably swift decision issued the day after the Post Office lodged its request for permission to appeal the recusal application judgment. It orders: "there be no stay of the Horizon trial or any of the other directions made by Fraser J; the stay of the Horizon trial to be revisited only if permission to appeal is given on the Recusal Appeal"
This suggests as part of its application (lodged on 11 April) to seek permission to appeal the recusal judgment, the Post Office urged the Horizon trial be stayed whilst the decision on whether to give permission to appeal is made. The Court of Appeal decided, in that regard at least, the Post Office can do one. The Horizon trial has been adjourned (save one isolated morning of evidence) since 21 March. It was originally due to have concluded this week. The recusal application was was made without warning just as two weeks of Horizon trial factual evidence was coming to a close. The claimants' QC Patrick Green described this as an attempt to "derail" proceedings. 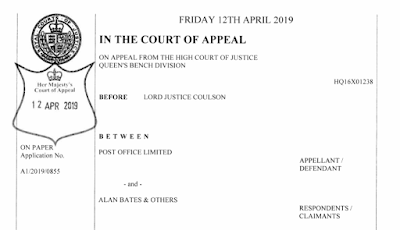 In his judgment, Mr Justice Fraser wondered if "the Post Office had taken their chance on how the evidence of fact in the Horizon Issues trial unfolded by waiting until the last day of that evidence before issuing the recusal application." Now we at least know the Appeal Court is not immediately going to biff the trial's scheduled 4 June resumption. The big mystery is the grounds on which the Post Office is seeking permission to appeal. "this is a suitable case for permission to be granted to the Court of Appeal. I have to demonstrate that there is a real prospect of success. In my respectful submission, there is one." The judge asked if he would like to offer the court anything in support of this submission. Lord Grabiner couldn't, or wouldn't, or in any effect didn't, which leaves us a little bit in the dark. I have heard it suggested the entire reason for the recusal application was to stop the Horizon trial before the expert evidence was heard because it was going to be so damning. I have a feeling it is going to be so complex nothing newsworthy will come of it. That said, I am no IT expert and it doesn't really matter whether it's newsworthy or not. It matters what the judge thinks, and the same day J Fraser received the recusal application, he was comfortably discussing lines of ORACLE code with Fujitsu's chief Horizon architect. This suggests that if there is some complex and damning evidence which is going to come out, his Lordship is going to spot it. The Court of Appeal has six weeks before the Horizon trial is due to resume. I have no idea how quickly its wheels grind (though the above order is encouraging). Ideally it will decide whether or not to give permission to appeal the recusal judgment before the end of April and, if it decides to grant permission, it will both hear the appeal and make a judgment on it before the end of May. That way, if the appeal fails, the Horizon Trial Express stays on track for its June re-start. If the appeal succeeds, the rest of the trial still might be able to go ahead as scheduled with a different judge who may be waiting in the wings. "The trial is not a dress rehearsal. It is the first and last night of the show"
In the light of this it's hard to see the Horizon trial being re-started from scratch whoever ends up managing it. From the Post Office's perspective, this litigation isn't going well. The judgment of the Common Issues trial has put it in a very bad position ahead of future breach trials. I personally thought the Horizon trial wasn't that revelatory, but given the Post Office is throwing everything possible at stopping it from happening, maybe I've missed something. Actually I've just had a look back at the first two weeks of evidence from the Horizon trial and there is quite a lot that has come out - serious error after serious error, evidence Subpostmasters were likely held responsible for losses caused by bungling IT engineers and the distinct possibility evidence supplied by Fujitsu used to prosecute Subpostmasters could be unsafe.